Before you start that home insulation project, learn about the many benefits of TAP Insulation. LoveToKnow editor Sally Painter recently had the opportunity to talk with Bill Turk, developer, co-founder and CEO of TAP (Thermal Acoustic Pest Control) Insulation to discuss this very innovative and multi-functional product. LoveToKnow (LTK): What is TAP Insulation made from? Bill Turk (BT): Our insulation is made from 85 to 87 percent post-consumer recycled paper. The majority is newsprint and other post-consumer recycled paper, including shredded money and other paper that conforms to certain quality standards. LTK: What makes it a "green" product? BT: Not only is TAP green due to its high recycled content, it is green in all product life-cycle phases, including production (it takes 10 times less energy to make than traditional insulation), performance (it reduces heat transfer better than traditional insulation because it is denser and fills holes and voids better than batted insulation), and disposal (there is virtually no waste in the installation of the product; it all can be blown in or saved for the next project). Additionally, TAP Insulation is a new method of providing responsible, preventative and proactive pest management as opposed to spraying chemicals once a pest problem arises. Last, the product is manufactured in 19 plants across the USA for the most efficient production and distribution to consumers, all of which contribute to TAP Insulation's small carbon footprint. In addition, TAP is the only Energy Star labeled pest control application. 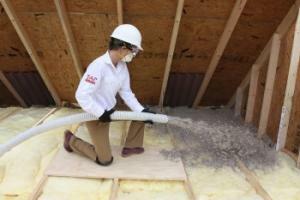 LTK: What makes your insulation a pest control product? Also, what types of pests? Is there a timestamp on this pest control property? Will the insulation need to be treated periodically? BT: Unlike standard cellulose insulation, TAP Insulation is infused with an optimal dosage and specific grind of boric acid, which serves as the pest control agent in the product (testing reveals that proper dosage and grind are essential to providing pest control capability). It helps control cockroaches, silverfish, ants, termites and other "self-grooming" insects listed on the label. The boric acid attaches to the bodies of the pests as they crawl through the insulation; the insects ingest the boric acid when they groom themselves (insects do not eat the insulation). A key benefit to TAP is that once it's installed, it works for the life of the structure because insects cannot build up a tolerance to boric acid. If properly installed and left undisturbed, the insulation never requires additional treatment. It is important to note that insects are not repelled by borates, as they are unable to detect its presence. LTK: What is the consumer benefit of the EPA seal? BT: Our EPA label is what differentiates us from other insulation products. Federal law requires that before selling or distributing a pesticide in the United States, a person or company must obtain registration or license from EPA. Before registering a new pesticide, EPA must first ensure the pesticide, when used according to label directions, can be used with a reasonable certainty of no harm to human health and without posing unreasonable risks to the environment. To make such determinations, EPA requires more than 100 different scientific studies and tests from applicants. The product is also Energy Star labeled by EPA. LTK: How is the insulation installed? BT: TAP is a "loose-fill" insulation blown into attics on top of existing insulation. TAP can also be installed as the sole insulation in attics and walls of new homes. LTK: What is the process for using your insulation in a renovation and remodeling project? Any special considerations or preparations needed such as old insulation removal? LTK: How does TAP Insulation serve as a sound proofing product? BT: TAP Insulation manufacturing process transforms cellulose fibers into soft, pliable, cotton-like loose fill insulation that penetrates into nooks and crannies behind attics and walls forming a protective layer. The cellulosic structure of the fibers is sound-absorbent, thus reducing unwanted noise in a home. LTK: Can homeowners purchase TAP Insulation through a contractor? BT: Because TAP is an EPA label pesticide, it can only be sold and installed through licensed pest management professionals. National pest control companies including Terminix, Orkin and others as well as local pest control operators in all 50 states now offer TAP. LTK: Are there any special considerations that a homeowner should keep in mind when using TAP Insulation? BT: TAP is best installed by professionals; if the existing insulation is damaged or soiled by pests, it is likely best to remove the old insulation before installing TA Insulation. LTK: How does TAP Insulation compare to conventional fiberglass insulation? BT: TAP is superior to traditional insulation in all aspects, including performance, production and disposal. TAP also provides responsible pest control that traditional insulation does not. LTK: What type of energy savings can be expected in a typical home when using your insulation? BT: While energy savings in a home depends on existing insulation levels, homeowners can typically save up to 20 percent on their heating and air conditioning bills after installing TAP. However, our experience has shown that greater savings may occur. LTK: What is the product lifespan? Will it compress over time requiring more insulation later on? BT: TAP Insulation pest control properties last for the life of the structure. As with all blown insulation, the product may settle slightly over time due to its pneumatic installation method (i.e. it is blown in and some of the air eventually recedes slightly), but the amount of the product required to attain appropriate R-values takes into account any potential settling issues so no repeat treatment is required if installed correctly. 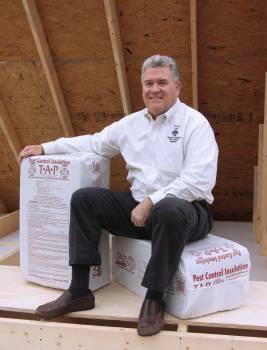 LoveToKnow would like to thank Bill Turk for taking time from his business to participate in this interview and share with readers his insulation product, TAP.